TORONTO We all know that anxious feeling of not being connected; frightened well miss a groundbreaking Facebook post, scared an important Snapchat will expire or terrified well miss the opportunity to catch a rare Pokemon. The horror! 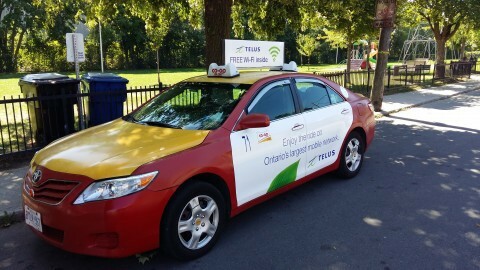 Luckily for Torontonians, TELUS has joined forces with Toronto Co-op Cabs to offer free Wi-Fi with their next ride (insert sigh of relief here). Wi-Fi-enabled Co-op Cabs will hit the streets of the 6ix starting September 12, with all vehicles offering free Wi-Fi by the end of the year. This is the first program of its kind in the Greater Toronto Area (GTA). The program follows TELUS 2015 partnership with Yellow Cab taxis in Vancouver, offering free Wi-Fi to passengers in that city and surrounding areas. The partnership, which is ongoing, was the first of its kind in Canada and has been a hit with data-hungry Vancouverites. Want to be the first to take a Wi-Fi cab for a spin? Keep your eyes peeled for vehicles with the TELUS logo. Accessing Wi-Fi is simple: as soon as you enter the cab, you will be greeted by a splash page on your mobile Internet browser where you’ll enter your email address to join the TELUS Wi-Fi network, and once onboard, you’ll be free to get back to your connected life¦for free. TELUS (TSX: T, NYSE: TU) is Canada fastest-growing national telecommunications company, with $12.6 billion of annual revenue and 12.5 million subscriber connections, including 8.4 million wireless subscribers, 1.6 million high-speed Internet subscribers, 1.4 million residential network access lines and 1.0 million TELUS TV customers. TELUS provides a wide range of communications products and services, including wireless, data, Internet protocol (IP), voice, television, entertainment and video, and is Canada’s largest healthcare IT provider. In support of our philosophy to give where we live, TELUS, our team members and retirees have contributed $440 million to charitable and not-for-profit organizations and volunteered more than 6.8 million hours of service to local communities since 2000. Created in 2005 by President and CEO Darren Entwistle, TELUS 11 Canadian community boards and 4 International boards have led the Company support of grassroots charities and have contributed more than $54 million in support of over 4,900 local charitable projects, enriching the lives of more than 2 million children and youth, annually. TELUS was honoured to be named the most outstanding philanthropic corporation globally for 2010 by the Association of Fundraising Professionals, becoming the first Canadian company to receive this prestigious international recognition. In the true spirit of a co-operative, Co-op Cabs was founded by a group of independent taxicab owners. They are the drivers, the owners and the shareholders they are a Co-operative. As a Co-operative, it has always been important to Co-op Cabs to give back to the community. Co-op Cabs/Crown Taxi participates in many community initiatives and charities as well as contributing to their customer philanthropic initiatives as well as supporting our community through local programs for youth and the homeless. Co-op Cabs easily identifiable red and yellow vehicles have been roaming the streets of Toronto since 1957 making Co-op Cabs/Crown Taxi the oldest taxi brokerage in Toronto, providing service to over 10,000 passengers each day and employing more long-term drivers than any other cab company in Toronto. Co-op Cabs has a steadfast commitment to providing the highest standard of taxi service to our customers. They are dedicated to providing safe, reliable and professional transportation for those in the Greater Toronto Area. Co-op/Crown offers flexibility to book across multiple platforms. Cabs can be booked through traditional voice booking at 416-504-CO-OP (2667), online booking at www.co-opcabs.com or through the Co-op Cabs/Crown Taxi App available in the App Store and Play Store for iOS and Android.